A dog’s eye is prone to injury and infection, especially so for bulge-eye breeds such as pugs, boxers, Boston terriers, Pekingese and others. 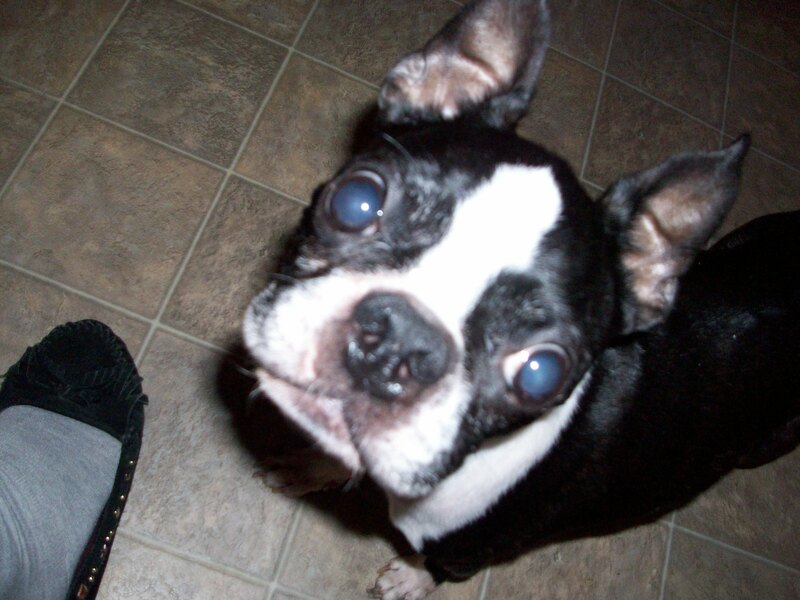 We have Boston Terriers, and about five days ago, the littlest (and oldest) one came in from a backyard romp yelping any time someone went near his eye. It looked swollen, so I put a cold cloth on it which seemed to help – a lot! But then a few days later I noticed an oozing slit where his left eye was supposed to be. In addition, his behavior was ‘off,’ as in more tired and droopy in general. I scooped all 10 pounds of him up in my arms and off to the vet we went. All the way there I harbored visions that he would lose his eye or need advanced and complicated surgery due to an eye ulceration or worse. The verdict: an eye infection, better known as conjunctivitis. Our beloved vet, I’ve been going to him for 20 years, sent us home with a small vial of eye drops, and 3 days later, our little Timothy is clearly on the way to recovery. Phew. We have always had animals, ever since I was on my own and out of the pristine house where a spec on the carpet wasn’t tolerated let alone any happy, tail-wagging or leg-rubbing creatures. Each and every one of my pets holds a precious place in my heart. But now that I am graying (I am into the natural look and can’t be bothered with the rigors of hair coloration et al), and my human-children have flown the coop, my canine, equine and avian creatures have become my babies even more so than before. I’ve always seen pets as every bit as important as any other living being, but my emotional attachment to them is now far greater. I surmise this is a function of being older, wiser, and having more time for them. Or is it a function of days passed when I overlooked them in my hurry to go to work, deal with soccer and baseball games, and do all the other things a household filled with kids requires? Probably. Now I treasure the simplicity of life and wonderful evenings with the total warmth of having one of my dogs ensconced in my lap while the other two snuggle as close as they can be on either side of me. I love the vigor of a long walk with one or two (can’t handle three) of them prancing along beside or in front of me. And the ultimate is the security of having them warm the bed beside me, two lined up on one side and the third at my toes. There is only one bad part, and you all know what that is. It is something I cannot write or talk about because I want to love and cherish every moment I have with them right now. Fur babies are the best! They sure are!! Unconditional love all the way.